Curcumin, a yellow pigment from Curcuma longa, is a major component of turmeric and is commonly used as a spice and food-coloring agent. It is also used as a cosmetic and in some medical preparations. 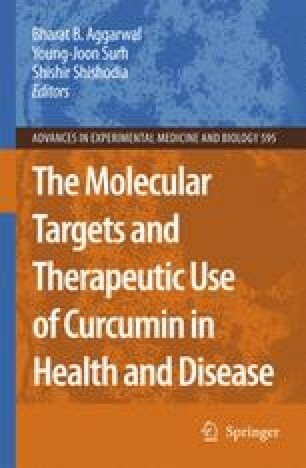 The desirable preventive or putative therapeutic properties of curcumin have also been considered to be associated with its antioxidant and anti-inflammatory properties. Because free-radical-mediated peroxidation of membrane lipids and oxidative damage of DNAand proteins are believed to be associated with a variety of chronic pathological complications such as cancer, atherosclerosis, and neurodegenerative diseases, curcumin is thought to play a vital role against these pathological conditions.